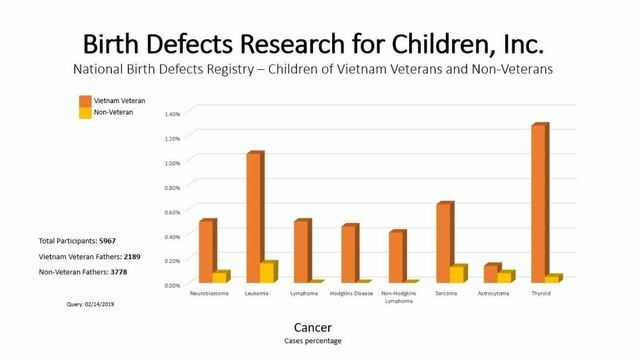 Image Credit: Birth Defects Research for Children, Inc.
Orlando, Fla. (WFLA) - Rates of cancer, learning disabilities and physical birth defects in the children of Vietnam veterans are staggering when compared to those in children of non-veterans. Birth Defect Research for Children's latest research shows mounting evidence that these children, now in their 30S, 40s and 50s exhibit health problems across the board. "It's so compelling to look at the data, I mean every time I look at it, I go wow!" said Betty Mekdeci, Executive Director of Birth Defect Research for Children. More than 2.5 million Americans served in South Vietnam during the war. Each one was presumably exposed to a harmful herbicide called Agent Orange, which is known to cause cancers, leukemia, heart disease and more. Ms. Mekdeci is alarmed by what she sees in children of Vietnam Veterans. "The proof is mounting every day. Because you don't like it, that doesn't make it go away," she said. 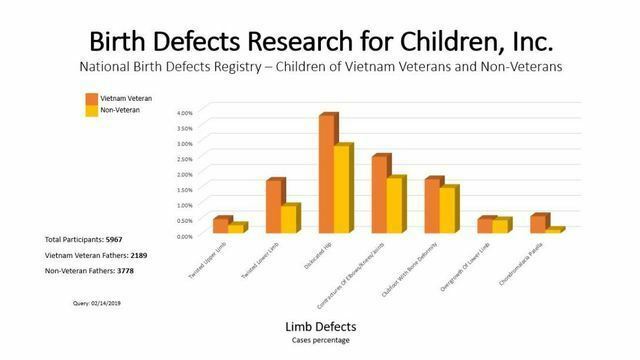 Her research reveals birth defects showing up at a higher rate in children of Vietnam veterans than non-veterans. Leukemia, thyroid cancer, along with ovarian cysts are showing up at 10 times and higher than the rate of children of non-veterans. "We're also starting to see auto-immune problems, childhood cancers, increases in allergic conditions," she said. Learning disabilities numbers are eye-popping. "We have an avalanche of children with the main thing are these neurodevelopmental problems," Ms. Mekdeci added. Dyslexia, attention deficit disorders and depression rates are all much higher than those in children of non-veterans. "We have had a lot of indication that the mothers may be having some effect from the fathers being exposed, mental disorders, female cancer, things like that," Ms. Mekdeci explained. "We know that there are chemicals that are found in seminal fluid, this is not new stuff." Agent Orange ravaged Navy veteran Lonnie Kilpatrick's heart. He was exposed on Guam. "I've had heart issues my whole life," Lonnie's daughter Keri Ackerson said. Keri and her daughter Emma suffer from brain malformations tied to Agent Orange. By age 9, Emma had to have brain surgery. "You've got lots of the veterans dying but the children and the grandchildren are going on and we're talking about thousands and thousands," Ms. Mekdeci stated. Following my report last year raising questions about passing on the poison to grandchildren, Birth Defect Research for Children began more research. The findings are preliminary, but concerning. "It's very concerning, it's very much like what we're seeing with the children," Ms. Mekdeci added. "You can't afford to ignore this because you don't like what we're finding, you can't afford to say, it's going to go away if you just look the other way."